Amazon and Facebook just became best friends, and they’d love for you to join their growing social circle. Today, Amazon.com announced that you can now link your account on the site to your Facebook profile, empowering a number of new social sharing features. On the most basic level, the move means you’ll be able to share Amazon reviews and your Amazon wishlist with your Facebook friends. This activity will be published to the Amazon website – none of your activity on the e-commerce site will be automatically published to Facebook. Of course, tools to share activity on Facebook will now be ubiquitous on Amazon in case you feel the urge. 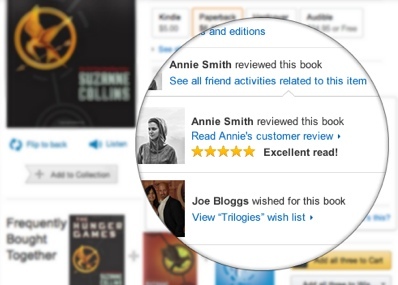 Amazon will also be able to use your Facebook likes to help recommend products on its site. If you Like the band Arcade Fire, for example, the site may recommend you buy their latest album Reflektor. Again, this won’t happen automatically – you need to personally activate this feature. You can enable and review your Amazon.com social media sharing settings by visiting amazon.com/gp/socialmedia/settings/. For more on Facebook privacy settings, check out Techlicious’s Comprehensive Guide to Facebook Privacy Settings.